Our 19th year for this annual Atlanta holiday tradition! This year we bring our Christmas of the Imagination to the Tucker Recreation Center (4898 Lavista Rd, Tucker, GA 30084) for an evening filled with the Magic of Radio. To celebrate the “12 Days of An Atlanta Christmas” we give you the gift of the opportunity to save big on tickets to this cherished holiday tradition. Prices start at $5 and then will go up by $1 per day beginning on December 4. Advance tickets on the day of the show will be $17 and they’ll be $20 at the door, so get yours early! TWO PERFORMANCES: Saturday, December 9 at 8:00 pm & Sunday, December 10 at 2:30 pm. Welcome! Welcome one and all to our family Christmas, to every family Christmas that ever was and ever will be! 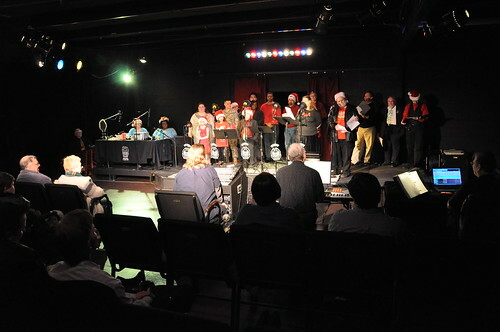 For the 18th consecutive year, ARTC brings you a selection of audio dramas that reveal the special celebrations of the holidays as seen through Southern eyes. Every year’s show is different, as we have expanded upon Thomas E. Fuller’s original vision, so if you’ve seen it before, you haven’t seen it quite like this. Add this unique tradition into your holiday season! As we did last year, we will be celebrating the 12 days of An Atlanta Christmas with a tiered pricing structure. Tickets are just $5 until November 27 and then will go up by $1 per day until the day of the show. Advance tickets on December 9 will be $17 and if you wait to buy at the door they will be $20. The GOOD Acting Studio is a very small venue, so get your tickets today! It’s that time again! Time to make your plans to see this year’s rendition of An Atlanta Christmas. As you may know, we change up the scripts every year to keep the show fresh, but this year we went all out and came up with four brand new, never-before-heard scripts from our talented writers. And, as if that weren’t enough, we will also be presenting the first ever live performance of Mercury: A Broadcast of Hope, our daily audio drama! We’ll be performing the episodes that will have gone live that very day on both days of the shows! Tickets are here, but get them early! The venue is small and tickets are just $5 until November 27 and then we start our yearly celebration of the 12 Days of An Atlanta Christmas, with the price going up by $1 every day until the day of the show! Advance tickets on the show dates will be $17, but tickets at the door will be $20. Welcome to the Twelve Days of An Atlanta Christmas (2015 edition)! Leading up to our December 12 and 13 performances at the Academy Theatre in Stockbridge, we’ll be bringing you our own take on this holiday classic! And an interview on WABE! But we’re getting ahead of ourselves. Those are the words you’ll hear tonight at the opening of this year’s An Atlanta Christmas, just as we’ve said them every year for the last 16. But every show is different. We mix and match our series of vignettes into something unique and then, of course, there’s the excitement of live theatre – you never know what’s going to happen. And so tonight, after a scant three weeks of prep time, we welcome you into our family for a night or two. We’re glad you’re coming. We’re so looking forward to seeing each and every one of you. As we get closer and closer to the performance date, we’d like to take a moment to thank everyone for the last 31 years (and counting!). For listening. For attending. For giving. For telling their friends and family. 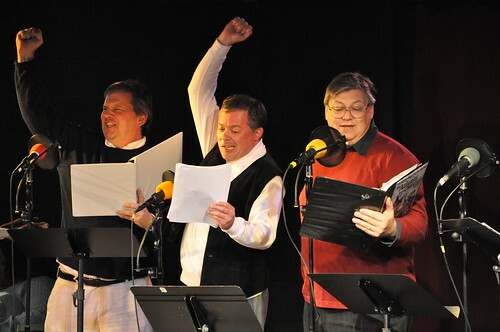 Audio drama is, by its very nature, an interactive art form. It’s a direct communication from the writers and actors and sound effects folks directly into the hearts and minds of our listeners. We feel so loved by all the generosity that you’ve shown us, but we’d like to give you the opportunity to show a little more, if you’re so inclined. ARTC is a 501(c)(3) non-profit corporation and, as we’re approaching the end of the year, you might consider whether a tax-deductable donation is right for you. There’s lots of other ways to support ARTC financially. Check out a few of these and find one that fits your budget and your level of enjoyment of what we do. It takes a lot of people to get audio drama into the ears of our audiences. Foley artists, audio engineers, floor managers, and a bunch of other people that we’re not sure what they do. Oh! They’re actors! Yes, those wonderful voices that are ultimately the focal point for telling the story. This year we’ve got at least ten of those talented folks for you. Come meet them! Ask them questions! Get their autographs (unless you’re planning to forge their signatures, in which case skip the autograph)! To create a truly immersive environment, you don’t just need Foley sound effects. You really need some good recordings, too. General ambiance, automobiles, aircraft, gunshots, and certain kinds of watery effects are just some of the examples of sounds that are better left in the digital realm, rather than trying to re-create them on the stage or even in the studio. 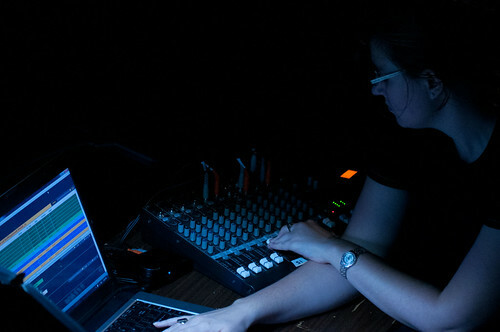 What recorded SFX do we have for this year’s show? How about Atlanta drivers trying to get around in the snow? ARTC is pleased and proud to have the Center for the Visually Impaired as our Partner in Imagination again this year. Since 2006, CVI has been the beneficiary of this annual gift that we give to our audiences, receiving 25% of total ticket sales. 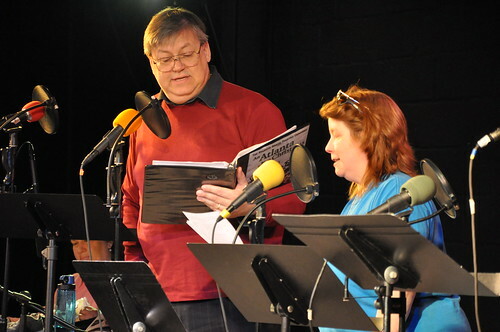 Audio drama is a wonderful art form for the visually impaired, but we don’t just want to provide entertainment. It’s important that we all contribute towards a total quality of life for our fellows in this world. What’s An Atlanta Christmas all about, you ask? At its root, it’s about memories. Memories of Christmases past, our city’s past, and our own past. And who doesn’t wax nostalgic at this time of year? For good or bad, the season often causes us to reflect on the highs and lows throughout our lives, often accompanied by a yearning to return to the good times and a wish for things to be better or promises to improve. At this year’s performance we will offer seven of our own favorite memories. Here’s the lineup for this year’s show (subject to change)! Opening – Welcome one and all to our family Christmas! Cut-Out Christmas – A young couple living through the Great Depression find a unique way to lift themselves up through the spirit of giving. Are You Lonely Tonight? – The office Christmas party doesn’t always create the best memories. But sometimes it does. The Legend of the Poinsettia – How did the poinsettia become a symbol of Christmas? Find out in this hilarious audio drama that tells the story of the fourth wise man who didn’t make the trip to Bethlehem. The Experts – The thing you don’t often get in the South at Christmastime is snow. More often we get ice. And that’s a totally different thing to try to drive on. Davy Crockett and Me – What does television have to do with Christmas in the 1950s? A lot, actually. 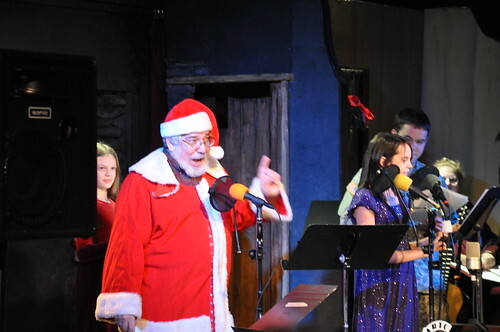 Blue Hannukchristmas Carol – This fan (and cast!) favorite returns again to tell the story of three spirits trying to overcome a case of mistaken identity to bring the true joy of Hannukah back into a young Jew’s life. Microphones are, of course, essential to audio drama. Here at ARTC we like to color-code them to make sure the actors know where to go. Because, y’know, actors. If you’ve ever seen us live before the pattern will look very familiar. And if you haven’t, now’s your chance! The color-coded microphones match the station colors. Please move to the center of the theatre and away from the doors.